We see it virtually every single time we sit in front of the big screen – no not Matthew McConnaughy taking his shirt off – product placement! Although Matthew might not have a clue on the subject, he may still be able to teach us something about it. Good product replacement is subtle and just obvious enough to settle into the viewer’s subconscious. Poor product placement is desperate for attention, repetitive and often unnecessary – like a shirtless McConnaughy. With all of the gadgets and popular brands surrounding us today, it’s virtually impossible to watch your favorite TV show without seeing products we use every day. There’s always going to be an Apple computer, Starbucks coffee cup or Coca-Cola just sitting on the counter. Most of these types of product placement are designed to operate subliminally, thus attaching to viewers’ memories without them even noticing them specifically. Companies hope that when you see that Coke bottle, you instinctively go to the concession stand or fridge to grab one. My all-time favorite example of product placement comes from the movie Cast Away with Tom Hanks. The movie contains both genius as well as Matthew McConnaughy-style product placement. Fed-Ex, I’m afraid, is the one taking their shirt off in this film. There’s nothing subtle about the main character working for the shipping giant and the screen being constantly littered with Fed-Ex boxes and packages just comes off as needy. While I don’t think it hurt the brand any, I also don’t think it provided as much advertising as a standard TV commercial. 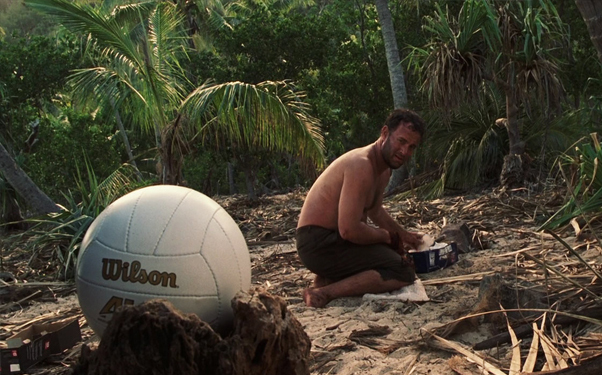 No, the true genius of Cast Away is the use of ‘Wilson’ the volleyball as Tom Hanks’ co-star. The sporting goods brand is repeatedly mentioned during high points of the film and is as subtle as uttering your best friend’s name. If I ever find myself in need of a volleyball, I will always think of Wilson because of this movie. Movie producers and brand managers are always teaming up, trying to find creative ways to help one another. Companies seek great brand recognition while producers strive to achieve a connection with their audience through authenticity. Do brands pay for the exposure or do the movie companies foot the bill? How much does product placement cost? Hold your horses! Check out part II of this blog coming soon. In the meantime enjoy this clip from Cast Away and then go buy a volleyball.